You might not realize that dolphins are closely related to whales. The scientific order, called Cetacea, includes dolphins, whales, and porpoises. The dolphin family Delphinidae has 36 species in all. It can get confusing at times, because some members of the dolphin family have the word whale in their common name. In fact, the largest dolphin is the killer whale! Depending on the species, dolphins range in color from white, pearl, and pink to darker shades of brown, gray, blue, and black. A dolphin is a mammal, and needs to breathe air through its blowhole, just as whales and porpoises do. Dolphins have smooth skin, flippers, and a dorsal fin. They have a long, slender snout with about 100 teeth, and a streamlined body. The single blowhole on top of their head has a flap that opens to reveal a pair of nostrils, which dolphins use for breathing when they surface. Ever wondered how dolphins sleep and get air to breathe at the same time? It would seem that if they fall asleep in the ocean, they'd sink, and then they wouldn’t be able to breathe! Because of their bone and body structure, and their ability to hold more oxygen in their body than humans can, dolphins are more buoyant—they float better. When they sleep, they don't sink. Rather, they float about 10 inches (25 centimeters) below the surface of the water. Small movements of their flukes periodically push them up to the surface so they can take a breath through their blowhole. Dolphins have an eye on each side of their head. Each eye moves independently of the other, so dolphins can see ahead, to the side, and behind them. They can also see very well both underwater and above water. Their vision out of the water is about as good as a cat’s or a dog’s vision. Dolphins that live in rivers have much less well-developed vision, probably because they live in murky water where good eyesight wouldn’t help them. Dolphins use clicking sounds for echolocation, and many use whistles to communicate with other members of their pod, or group. In addition to clicks and whistles, researchers have described dolphin sounds as screams, calls, moans, trills, grunts, squeaks, and even a creaky door sound. Bottlenose dolphin researchers think that slow clicks and high-pitched whistles are signs of contentment, while harsh, low squawks express annoyance. All dolphins make sounds that travel underwater, bounce off something, and then return to the dolphins as echoes. This sophisticated echolocation allows dolphins to find food or avoid predators, even in dark or murky water. Dolphins that live in rivers have excellent echolocation for fishing in muddy waters. Dolphins’ natural abilities to swim fast and leap clear of the water are what make them such entertaining performers. They are the most agile and speedy of all marine mammals. They are known to travel with ships, leaping in front of the bow and swimming in the wake. Dolphins are found in all the oceans of the world. Some live mainly along coastlines, but others live far out at sea. Dolphins work together to eat. They can herd schools of fish for group feeding. Some even use their clicking sounds for herding the fish. Bottlenose dolphins rush up onto mud banks to catch fish they’ve stranded there. Most dolphins eat fish, octopus, squid, and shrimp. Killer whales include seals, smaller whales, penguins, birds, and even small walrus in their diet. Dolphins live and play in schools of five to hundreds of animals. Some can swim and roll in formation, just like synchronized swimmers. Dolphins also work together to help when one animal is sick, hurt, or giving birth. They take turns pushing the hurt or young dolphin to the surface so it can breathe. Pods of dolphins will attack an intruder as a group and can even kill a large shark by ramming it as a group! The San Diego Zoo does not have dolphins in its collection. Hunting, pollution, and human development along coastlines and rivers have seriously impacted some dolphin populations. Dams, habitat loss, and fishing nets are also hurting dolphins. In 2000, many countries joined the International Dolphin Conservation Program, which is an international agreement to reduce the numbers of dolphins that are lost through tuna fishing. The Hector's dolphin Cephalorhynchus hectori is endangered. Some, like the bottlenose dolphin Tursiops truncatus, are protected in US waters by the Marine Mammal Protection Act of 1972. Every dolphin has its own distinct whistle to communicate with others in its pod. Dolphin teeth are cone shaped with sharp points that help to hold prey. 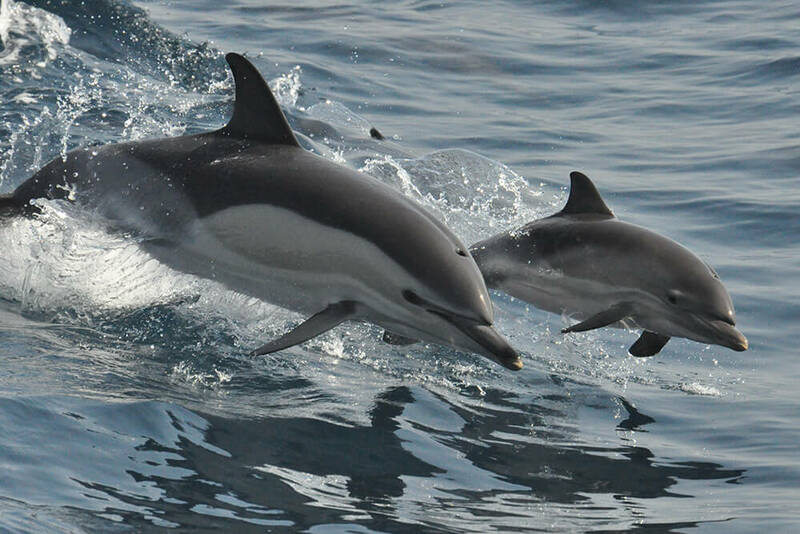 The three best-known dolphins—white-sided dolphins, bottlenose dolphins, and spinner dolphins—can be seen in marine mammal demonstrations, on television shows, and in movies.